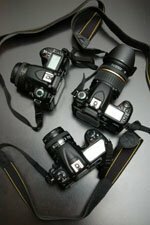 It is hard to keep on top of the latest Digital Photography Industry news raging from innovations in the digital camera/equipment world to photography awards and contests to issues concerning the professional digital photographer. We are working on making things easier for you and have set up an automatic news update system for you here. And, unlike most news services, we make it easy to provide direct public commentary on news items as well. Have Digital Photography News commentary to share? Do you want to share your view on a Digital Photography News headline that caught your attention? Or are there any news related to digital photography that you think should be shared but isn't here yet? This is where you can submit information about it.